Count and sort the declaration vote envelopes received during the day (these remain unopened). In the Northern Territory only, count the Statehood referendum ballot papers. Only ordinary votes were counted on election night, just over 82 percent of votes at the 1998 election. Absent and provisional votes cast at the polling place were put aside as checks must be made at the Divisional Office to ensure that these ballot papers were eligible to be included in the count. Immediately after the doors closed the polling officials opened and emptied the House of Representatives ballot boxes. 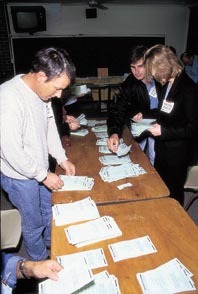 The green ballot papers were unfolded and all the number '1' votes (first preferences) were counted for each candidate and put into separate piles. The informal ballot papers were also counted and set aside separately. The first preference results for each candidate were tabulated and phoned through to the DRO, along with the number of informal ballot papers. The DRO entered the figures received from each polling place in their division into the AEC's national computerised Election Night System. The figures entered into the computer system were transmitted to the National Tally Room in Canberra where they were available on computer terminals and displayed on the National Tally Board. Polling officials then conducted a two-candidate preferred (TCP) count, which was a distribution of preferences to two selected candidates. The TCP count was conducted to give an early indication of who was most likely to win each seat since this is not always clear from first preferences. The AEC selected the two candidates for the TCP count based on historical voting patterns in previous elections. The names of the two candidates were kept confidential until the close of the poll. The ballot papers for all other candidates were examined to see which of the two selected candidates the voter had put ahead in their preferences. This result was then tabulated and telephoned to the DRO, who in turn entered it into the computerised Election Night System. Following the House of Representative count, the polling officials opened and emptied the Senate ballot boxes. The white ballot papers were unfolded and all the number '1' votes for groups above the line and for ungrouped candidates below the line were counted. The first preference votes for groups and ungrouped candidates were tabulated and phoned through to the DRO, who entered these figures into the computerised Election Night System. Because Senate results cannot be calculated until the State-wide total of votes used to determine the 'quota' is known, it was not possible to get more than a general impression of the Senate results on polling night. The polling officials then placed all the House of Representatives and Senate ballot papers into sealed parcels and along with the declaration vote envelopes securely delivered them to the DRO. Candidates were able to appoint scrutineers, as their personal representatives, to observe the counting of the votes at polling places. Scrutineers had the right to observe all stages of the scrutiny and could challenge the formality of ballot papers but they could not touch any ballot paper. The National Tally Room (NTR) was organised by the AEC to provide a central point for the display of election results on election night. It is one of Australia's largest media gatherings with representation from the radio, print and television media. Election results were transmitted to the NTR from every Divisional Office around Australia via the computerised Election Night System. The results were displayed on rows of computer terminals which were available to the media and members of political parties. The results were also simultaneously fed to the television networks who presented their election coverage from temporary sets constructed at the back of the NTR. A manual backup system using facsimile and telephones was installed in case of computer problems. Election figures started coming into the 1998 NTR shortly after 6.30pm, mainly from the smaller polling places in the Eastern States. The figures kept coming in until midnight when the final Western Australian figures for the night were available. The election figures for the House of Representatives were also displayed on a manual tally board which dominated the front of the NTR. The tally board provided a backdrop for the television coverage of the election and was read by the many members of the public that visited the NTR. The 1998 board also displayed the Northern Territory referendum results. The AEC also provided computer terminals directly linked to the election results system to the Prime Minister, Mr John Howard in Sydney and the Leader of the Opposition, Mr Kim Beazley in Perth. The NTR for the 1998 election was back at its usual venue at Exhibition Park in Canberra. It took about two weeks to build, three days to dismantle and many months of detailed planning to organise. organising the electricity supply, air conditioning, telecommunication lines and computer cabling. Elaborate security arrangements were in place during both the building of the tally room and on election night. To ensure the smooth running of the NTR the AEC also conducted a rehearsal on the Thursday before polling day to test the computer system and to provide training for the casual staff employed on the National Tally Board. The NTR cost approximately $1 500 000 to organise – this included the hire of venue, communication and computing facilities, equipment hire, casual staff wages and security. The television networks met the costs of constructing their own sets. up to 650 amps of electrical load (enough to power a small town). The AEC hosted on election night a 'virtual tally room' on the Internet. This election website at election.aec.gov.au meant people could access on their home computers up-to-date election results only minutes after they were received in the National Tally Room. People visiting the site on election night were able to access progressive House of Representatives results for all divisions, state party summaries and national totals. Early figures from the Senate count for all States and Territories were also available. The site was updated every three minutes on election night and on a very regular basis in the following weeks. The website was designed to be interactive and allow people visiting to experience some of the atmosphere of election night at the tally room. The site included live pictures and sound from the National Tally Room which could be manipulated in several directions as if they were actually looking around the tally room. The software and technology necessary to host the 'virtual tally room' had to be developed especially for the AEC. An electronic feed was taken from the AEC's mainframe database and published simultaneously to three web centres located in Canberra, Sydney and Melbourne. The site cost just over $193 000 to organise and run. The 'virtual tally room' proved to be the biggest live Internet event to ever occur in Australia. In the six hour period on election night the website received over eight million hits which corresponds to over one million pages viewed. In the two weeks following polling day, the site received an additional 24 million hits.